We arrived in Tiberias yesterday and our driver brought my bike up from Jerusalem. It wasn’t very hot today so I decided to take a nice long ride and explore some new things. First, the Tanureen Restaurant which has built a new section where we will bring our groups in the future. Then I went to visit Magdala, the center being built by the Legionaries over the place where Mary Magdalene lived. They’re rushing to get to church done before the Pope arrives next spring. However I’m not real happy about the place because are also building a Protestant Chapel which seems like a compromise to me. 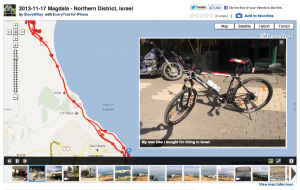 Enjoyed riding the bike, getting some good exercise and exploring new things in the Holy Land. Click here for maps, videos and pictures.